Dean Gooderham Acheson (April 11, 1893 – October 12, 1971) was an American statesman and lawyer; as United States Secretary of State in the Truman Administration during 1949-1953, he played a central role in defining American foreign policy for the Cold War. He likewise played a central role in the creation of many important institutions including Lend Lease, the Truman Doctrine, the Marshall Plan, NATO, the International Monetary Fund, and the World Bank, together with the early organizations that later became the European Union and the World Trade Organization. He also supported U.S. membership in the United Nations, and was Truman's liaison between the Oval Office and the Senate on ratifying this. Acheson's most controversial statement was his speech on U.S. policy toward Asia before the National Press Club in January 1950, in which he excluded Korea from America's defense perimeter. Many scholars are convinced that Acheson's announcement, though authoritatively representing Truman Administration policy, led Soviet ruler Joseph Stalin to conclude that the United States would not intervene if North Korea were to attack South Korea. Such a Soviet-supported invasion of South Korea did occur in June 1950, which led to the 1950-53 Korean War. Acheson was a prominent defender of State Department employees accused during Senator Joseph McCarthy's anti-Communist investigations, incurring the wrath of McCarthy himself. He thought that McCarthy was a loose canon who saw anyone on the political left as a communist. Acheson was instrumental in the prehistory of the Vietnam War, persuading Truman to dispatch aid and advisers to French forces in Indochina, though he would later counsel President Lyndon B. Johnson to negotiate for peace with North Vietnam. During the Cuban Missile Crisis, President John F. Kennedy called upon Acheson for advice, bringing him into the executive committee (ExComm), a strategic advisory group. The value of his legacy lies in his alliance building. He believed the Cold War would be won by isolating the Soviet Union and ensuring that the free world was united in its defense of liberty and democracy. He knew that a strong Europe would be a better ally, thus his support for European reconstruction after World War II. Dean Acheson was born on April 11, 1893, in Middletown, Connecticut. His father, E. "Edward" Campion Acheson, was an English-born Church of England priest who, after several years in Canada, moved to the U.S. to become Episcopal Bishop of Connecticut. His mother, Eleanor Gertrude Gooderham, was a granddaughter of a prominent Canadian distiller, William Gooderham (1790–1881), founder of the Gooderham and Worts Distillery. Acheson attended the Groton School and Yale College (1912–15), where he joined Scroll and Key Society. At Harvard Law School from 1915 to 1918, he became a protégé of professor Felix Frankfurter. At that time, a new tradition of bright law students clerking for the U.S. Supreme Court had been begun by Supreme Court Justice Louis Brandeis, for whom Acheson clerked for two terms from 1919 to 1921. Frankfurter and Brandeis were close associates, and future Supreme Court Justice Frankfurter suggested that Brandeis take on Acheson. A lifelong Democrat, Acheson worked at the Washington, D.C., law firm, Covington & Burling, often dealing with international legal issues before Franklin Delano Roosevelt appointed him Undersecretary of the Treasury in 1933. Acheson proved a conservative in economic matters. He opposed deposit insurance for banks, for example; he resigned over Roosevelt's plan to change the price of gold, but did not publicly attack Roosevelt. In 1940, Roosevelt brought Acheson back into government as a senior official of the State Department, where he developed much of the economic warfare waged by the United States against the Axis Powers. He designed the American/British/Dutch oil embargo that cut off 95 percent of Japanese oil supplies and escalated the crisis with Japan in 1941. Historians debate whether Roosevelt fully understood and approved the scope of the embargo, but there is no doubt Acheson knew it could produce war. In 1944, Acheson played a central role in the Bretton Woods Conference as the head delegate from the State Department. At this conference, the post-war international economic structure was designed. This conference was the birthplace of the International Monetary Fund, the World Bank, and the General Agreement on Tariffs and Trade, the last of which would evolve into the World Trade Organization. Later, in 1945, Harry S. Truman selected Acheson as his Undersecretary of State; he retained this position working under Secretaries of State Stettinius, Byrnes, and Marshall. At first, Acheson was conciliatory towards Stalin. What changed his thinking was the Soviet Union's attempts at regional hegemony in Eastern Europe and in Southwest Asia. When he realized the Soviets were working outside traditional diplomatic channels, Acheson became a devoted and influential cold warrior. The Secretary was often overseas, making Acheson Acting Secretary. During this period, Acheson cemented a close relationship with President Truman. Acheson devised the policy and wrote Truman's 1947 request to Congress for aid to Greece and Turkey, a speech which stressed the dangers of totalitarianism rather than Soviet aggression and marked the fundamental change in American foreign policy that became known as the Truman Doctrine. Acheson designed the economic aid program to Europe that became known as the Marshall Plan. He believed the best way to contain Stalin's Communism and prevent future European conflict was to restore economic prosperity to Western Europe, to encourage interstate cooperation there, and help the American economy by making its trading partners richer. In 1949, Acheson was appointed Secretary of State. In this position, he built a working framework for containment, first formulated by George Kennan, who served as the head of Acheson's Policy Planning Staff. Acheson was the main designer of the military alliance NATO, and signed the pact for the United States. The formation of NATO was a dramatic departure from historic American foreign policy goals of avoiding any "entangling alliances." The failure of the United States to prevent the 1949 communist victory in the civil war in mainland China precipitated several years of organized opposition to Acheson's tenure, a period to which Acheson refers in his outspoken memoirs as "The Attack of the Primitives." Although he maintained his role as a firm anti-communist, he was attacked by various anti-communists for not taking a more active role in attacking communism abroad and domestically, rather than a mere containment of communist governments. Both he and then Secretary of Defense George Marshall came under attack from men such as Joseph McCarthy; Acheson became a byword to some Americans, who tried to equate containment with appeasement. Richard Nixon, who later as President would call on Acheson for advice, would complain of "Acheson's College of Cowardly Communist Containment." This criticism grew very loud after Acheson refused to "turn his back on Alger Hiss" when the latter was accused of being a Communist spy, and convicted (of perjury for denying he was a spy). On December 15, 1950, the Republicans in the House of Representatives resolved unanimously that he be removed from office, to no avail. After the 1952 presidential campaign, Acheson returned to his private law practice. Although his official governmental career was over, his influence was not. Acheson headed up Democratic Policy Groups during the Eisenhower years. Much of President Kennedy's flexible response policies came from the position papers drawn up by this group. Acheson's law offices were strategically located a few blocks from the White House and he accomplished much out of office. He became an unofficial adviser to the Kennedy and Johnson administrations. During the Cuban Missile Crisis, for example, he was dispatched by Kennedy to France to brief de Gaulle and gain his support for the United States blockade, a role which he took seriously. During the 1960s, he was a leading member of a bipartisan group of establishment elders known as The Wise Men (the Temporary Council Committee, or TCC) who initially supported the Vietnam War but then turned against it at a critical meeting with President Lyndon Johnson in March 1968. He reconciled with his old foe Richard Nixon and was an important adviser to President Nixon. In 1964, he received the Presidential Medal of Freedom. In 1970, he won the Pulitzer Prize for History for his memoirs of his tenure in the State Department, Present at the Creation: My Years in the State Department. In 1971, Dean Acheson died of a massive stroke at his farm in Sandy Spring, Maryland, on October 12, 1971, at the age of 78. He was survived by a son, David Campion Acheson, and a daughter, Mrs. (Mary) William P. Bundy. ↑ Robert L. Beisner, Dean Acheson: A Life in the Cold War (New York: Oxford University Press, 2006), 7. ↑ Beisner, Dean Acheson, 7-9. ↑ Irvine H. Anderson, Jr., "The 1941 De Facto Embargo on Oil to Japan: A Bureaucratic Reflex," The Pacific Historical Review 44(2): 201-231. ↑ Beisner, Dean Acheson, 20. ↑ Robert L. Besiner, "Patterns of Peril: Dean Acheson Joins the Cold Warriors, 1945-46," Diplomatic History 20 (3): 321-355. ↑ Robert Frazier, "Acheson and the Formulation of the Truman Doctrine," Journal of Modern Greek Studies 17(2): 229-251. ↑ Beisner, Dean Acheson, 643-4. ↑ Beisner, Dean Acheson, 631. ↑ Beisner, Dean Acheson, 460. ↑ Beisner, Dean Acheson, 634. ↑ Beisner, Dean Acheson, 636-637. ↑ Beisner, Dean Acheson, 640. Anderson, Irvine H., Jr. "The 1941 De Facto Embargo on Oil to Japan: A Bureaucratic Reflex." The Pacific Historical Review 44, no. 2 (May 1975): 201-231. Beisner, Robert L. Dean Acheson: A Life in the Cold War. New York: Oxford University Press, 2006. ISBN 0-19-504578-5. Beisner, Robert L. "Patterns of Peril: Dean Acheson Joins the Cold Warriors, 1945-46." Diplomatic History 20(3): 321-355. Chace, James. Acheson: The Secretary of State Who Created the American World. New York: Simon & Schuster, 1998. ISBN 9780684808437. Frazier, Robert. "Acheson and the Formulation of the Truman Doctrine." Journal of Modern Greek Studies 17(2): 229-251. Harper, John Lamberton. American Visions of Europe: Franklin D. Roosevelt, George F. Kennan, and Dean G. Acheson. New York: Cambridge University Press, 1994. Isaacson, Walter. The Wise Men: Six Friends and the World they Made: Acheson, Bohlen, Harriman, Kennan, Lovett, McCloy. New York: Simon & Schuster, 1986. ISBN 9780671504656. Mcglothlen, Ronald L. Controlling the Waves: Dean Acheson and U.S. Foreign Policy in Asia. New York: W.W. Norton & Co., 1993. ISBN 9780393035209. McNay, John T. Acheson and Empire: The British Accent in American Foreign Policy. Columbia & London: University of Missouri Press, 2001. ISBN 9780826213440. All links retrieved November 8, 2017. Oral History Interview with Dean Acheson Harry S. Truman Library and Museum. 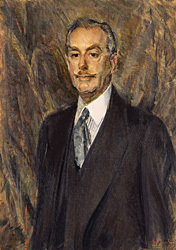 Dean Acheson National Portrait Gallery, Smithsonian Institution. 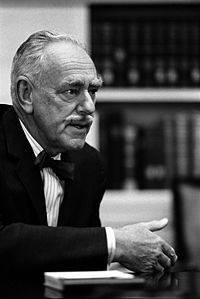 Biographies of the Secretaries of State: Dean Gooderham Acheson U.S. Department of State, Office of the Historian. This page was last modified on 8 November 2017, at 17:34.